A German shepherd was beaten to death in Merced on Friday night. The gut-wrenching moments were caught on surveillance video. MERCED, Calif. (KFSN) -- A German shepherd was beaten to death in the North Valley. The gut-wrenching moments were caught on surveillance video. The attack on the Merced family's dog happened just after 8 p.m. Friday. Merced police officers believe the suspects maliciously and intentionally killed the dog. But the men accused of this heinous crime tell Action News it was an act of self-defense. Family members in Merced say their 2-year-old German shepherd was viciously attacked and killed by their next-door neighbors. Disturbing images of two men caught on surveillances video, beating a dog in the corner of their yard with a bat and flashlights. Kimberly Saesee said her German shepherd Kuma somehow got into the neighbor's backyard late Friday and would never be seen again. Saesee's uncle is seen peering over the fence trying to see what's going on but stays quiet out of fear. "That could've very well been a person. How do you beat something living? I mean he was like family to us. He pretty much was a person to us. How do you beat someone to death?" said Saesee. Sam Clendenin, 24, and Tony Clendenin, 52, were arrested for cruelty to animals and conspiracy to commit a crime. Sam Clendenin, 24, and Tony Clendenin, 52, were arrested for cruelty to animals and conspiracy to commit a crime. The father and son live next door and bailed out late Friday. But they say they were defending themselves after the dog lunged to attack Sam while he was outside smoking. Neither party knows how the dog got over. The suspects say he jumped over but the neighbors say he got through broken boards in the fence and was baited. "I wasn't expecting to see a 200-pound dog growling right in my face in the dark in my own backyard. I should feel secure. It's my property," said Sam Clendenin. He said once they got Kuma into a corner, he stood on top of the dog to gain control. That's what you see in video from the Saesees' cameras just over the fence. He says that's when they started to hit the dog. "It was on right then and there. I was on a landmine. I didn't know what to do. If I get my foot off this dog, it's going to charge. I already know that, so you need to help me. And the only thing that goes through his head is baseball bat," said Sam Clendenin. However, Merced police said otherwise. Officers said the Clendenins gave inconsistent and conflicting statements. At this point they don't believe the suspects were acting in self-defense -- instead they went after Kuma and purposefully killed him. "I hope they go to prison. I don't think anyone should be able to do that to anyone or anything. It's not right. It's not right," said Saesee. Saesee says her family may move at this point since they are so traumatized. They add that they may also file a restraining order against the suspects. 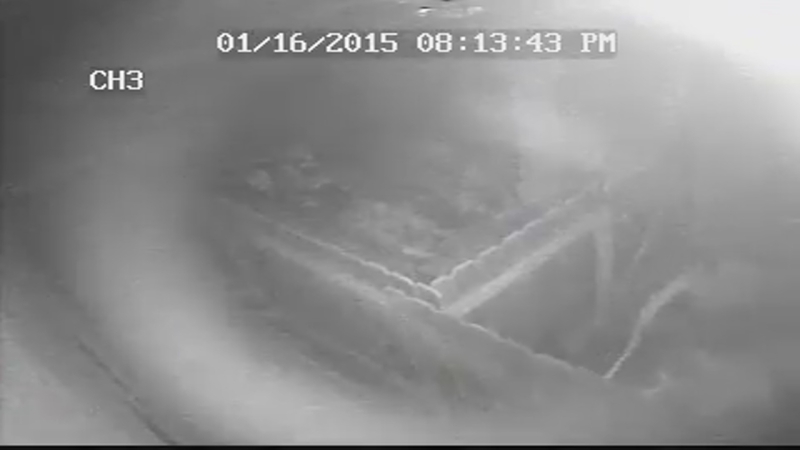 Kimberly Saesee provided this raw video to Action News.